Gale's opened for business in 1950 as a small nursery in Maple Heights, and it has been growing ever since. Today, visitors to Gale's find a spacious, full-service garden center stocked with the most desirable plant varieties, the safest and most effective lawn and garden care products, wildlife-friendly food and feeders, and great accessories for home and garden. Much has changed since Gale's sold its first plants in 1950, but one thing remains the same: Gale's dedication to quality, value and knowledgeable service. Our shoppers enjoy the best of yesterday and today - fresh and thriving plants, new and innovative products and an old-fashioned tradition of friendly customer care. Whether you are a beginner or a seasoned gardener, Gale's in Maple Heights will help you shape your home's environment, indoors and out. Come see why gardeners have been returning to us for over six decades. 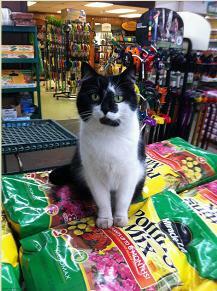 Come visit "Domino" our store pet!